The end may be near for “The End of the World” as we know it. 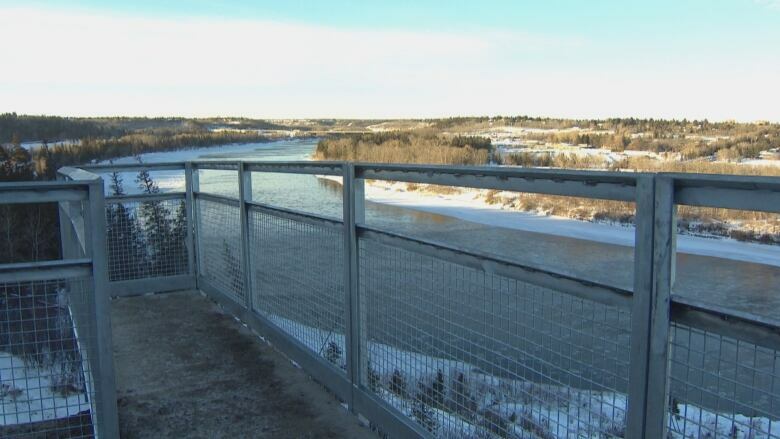 On Tuesday, city council’s executive committee will discuss plans to build a formal lookout at the illicit and unsafe, but popular viewpoint in Edmonton’s North Saskatchewan River valley. If it ain't broke; why fix it. It's a safety hazard and just waiting for an accident, that's why its broke and needs fixing. Mixed emotions on this. I cant help but feel this will be spending too much money on something that doesnt need it, and any appeal the place had will be gone with this new proposal. On the flip side last thing the city needs is a few drunk kids fall off this thing and kill themselves. Hmmmm. Would have been nice to re-establish Keillor Drive back in the day. Why do we need Keillor road again? Even if it wouldn't have cost many millions to stop the road from falling into the river (valley), I still don't see the point of the roadway. Good riddance! That's the driver in me talking. Very convenient route (and scenic) to get from SW to Central. Isn't the appeal of the end of the world that you're not supposed to be there? I feel like this will stop the crowd that goes there from returning. Maybe it'll bring a new crowd, but I'm doubtful. Yup that is the appeal, by putting up railings you eliminate some of the allure. Personally I could only go about 3' out from the dropoff. Mixed as well, but this will be a wonderful new addition. It is a waste of money, As it stands right now it's a hidden and forbidden gem of the city where nothing serious has happened yet. But putting up barricades and developing it, all you do is rip the warmth and charm out of a spot like that. While we're at it; let's tear down the rickity deck overviewing the core just east of the Conservatory; it's not exactly safe. Shaking me head. So we're looking at potentially 5 million when it's all said and done, at a very wild guess. Millions, anyways. That seems like a lot of money when the city can barely afford to maintain the existing trail system in the river valley, let alone improve it. Agreed. The current infrastructure is in poor shape as it is... but we can afford more? I doubt it. So the city going to build something proper before someone gets hurt or killed and they get sued. I agree it's not a bad thing to have a nice proper viewing platform there but I think it's for the wrong reasons. Just ask all the dummies that ignore "Do not enter" signs and climb fences at viewing platforms at waterfalls, it's going to happen here too. The End of the World? Damn millennials naming stuff. LOL back in my day it was simply Keillor Road and a backed up traffic clogged shortcut during rush hour with a nice taste of the rivervalley. IIRC it closed in the summer of 1994, September 1st if I remember right... it being the big city discussion that year. Just detonate or demolish the remaining piers which is what any city ought to have done anyway. to leave those standing as is for decades, right in a central area of the city, right in the river valley is incomprehensible. The piers should have been removed when the massive slide occurred. Also, obvious this is a slide zone, why build much of anything there? Do we know that that the slide potential is fully dissipated in that area? Take out the concrete abutments and problem solved. The popular point overlooks the North Saskatchewan River and offers breathtaking views of the river valley. “I understand why people go there, I’ve gone down to take a look at it,” Mayor Don Iveson said after the decision. Construction won’t be done until a geotechnical study says it’s safe to do so. The city will start by looking at the piles that already exist in the structure in an effort to make sure they’re not making an already bad situation worse. "Construction on the lookout, now called Keillor Point, began on Monday morning...Design work for the project includes construction of a staircase, hand railing, a formalized viewing area and a granular trail. The changes are meant to improve safety and accessibility at the popular picturesque viewpoint." Last edited by Akerr12; 22-10-2018 at 12:24 PM. Stop paving over my hiking trails. 5 million $1.5 million would have been better spent on the Cold War Bunker. Now that was the possible End of the World. Better yet, spend that money on a truly spectacular view of the Gondola Project. The seed money to allow the private development of a needed urban transit project. A fence will be nice. The vandals will also love having a convenient fence picket (cleat) for their ropes. Then they’ll sue the City from their hospital beds if the pickets are sharp edged. As a mountain biker, I would prefer they don't pave over trails as well. As for ringing bells, perhaps you didn't hear them... Too many walkers seem to operate in a world completely oblivious that someone else might be around, and add some ear buds in for the joggers at full blast... What's the point of a bell when you wont hear it anyways. No ear buds and no I didn’t hear them. Heard bells from the vast majority of bikers passing. I guess it’s obvious that I must have selective hearing. Sorry - But, have seen it from the Valley Zoo and I can see why it's so popular. And I think Sk. Drive residents made a good choice making it adult accessible. Nothing drives away partying teens more than adults hanging around! I think the thread title can be changed to "Completed" now. Not just yet. I hope that they finish the project properly by applying a stain to the pressure treated wood to add further protection to the wood. Stain or paint will add years of life to the construction and save taxpayers money in reduced maintenance. Last edited by Edmonton PRT; 21-12-2018 at 05:09 PM. Other newscasts say a grand opening will occur in the spring once they've finished some landscaping and such. Note the mounting of the posts to the side. On the high level bridge they could have done something similar in mounting the anti-suicide fence rather than squeeze the pedestrian space. I think this looks great. One thing I'm curious about, and I hope someone with more knowledge of construction costs can provide insight on this, is how this project came out to $1.5 million? Seems like alot to install railings, add wooden staircases and eventually do some landscaping. If it had been done during a boom economy, it would have cost 6 million. Moreover, it really is a case of putting lipstick on a pig. We need more of this thinking. As one of my favourite quotes goes: If you have a skeleton in your closet, you might as well teach it to dance. Looks very uh, functional. Sort of like a dog run. Another opportunity to do something special is lost. Would always be nice to go beyond the basics but like what? Also the view is the prime attraction. Just like the other three. Last edited by Edmonton PRT; 23-12-2018 at 03:56 PM. 5 million $1.5 million would have been better spent on the Cold War Bunker. Now that was the possible End of the World.Better yet, spend that money on a truly spectacular view of the Gondola Project. The seed money to allow the private development of a needed urban transit project. Where is the common sense? Now that's something I could get behind. Open the Cold War bunker as a tourist attraction. That's a cool piece of Edmonton history that could be put to good use.